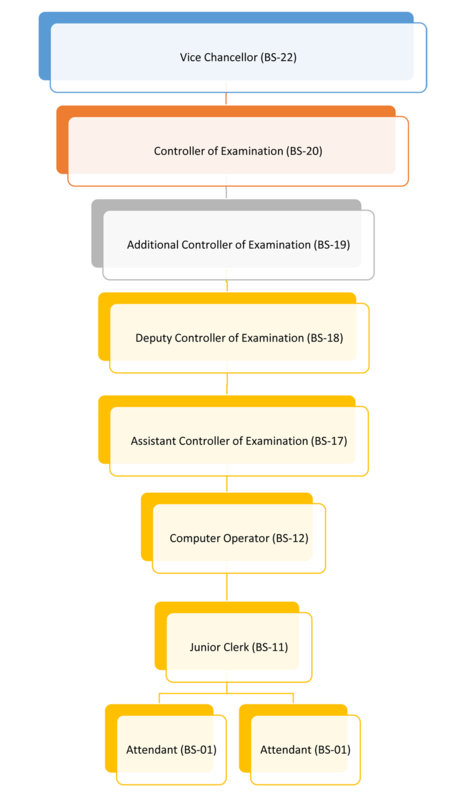 The office of the Controller of Examinations began its working along with the establishment of the university in 2013.The office of the Controller of Examinations is chiefly responsible for the conduction of exams in awell organized manner. This entails the preparation of date sheets, examination schedules, processing of transcripts, degrees & certificates. Thus the controller Office is incharge of all the matters related to examinations. I believe that, office of Controller of Examination (C.O.E) can play a key role in the academia if its resources are used for strategic planning and development. It is very important for any University that aims to rank high in the education sector as well as in society, to have an eye on facts & figures provided by C.O.E to forecast future and budget needs. Examination rules and regulations along with the SOP’s are available on for faculty, students and administration for their guidance. All matters concerned with the conduction of examination. Preparation and display of final result notification (s) and sending the grade reports to students. Arrangement for the timely issuance/provision of the examination material, instructing the supervisory staff and holding their meetings as and when required. Postponement or cancellation of examination, in part or in whole, in the event of malpractices or if the circumstances so warrant after approval of Vice Chancellor. Appointments of unfair means committee with the prior approval of Vice Chancellor in relation to examination matters for carrying out investigation and convene meeting and issue notices thereof. Bringing into the notice of the Vice Chancellor all cases of infringement of rules of examinations with full report for disposal. Maintaining over all examinations record of the students. Ensuring and maintaining strict secrecy of all information regarding the examinations. Issuance of transcripts to Under Graduate & Post Graduate students. Keep record of Student’s result and ensure departmental secrecy. Exercising such other powers and perform such other duties as may be prescribed or assigned to him, by the Vice Chancellor.